It is Graduation time again in the Philippines. Young graduates are now about to be thrown into the real world, a world where people work for money, for fulfillment or even for just killing time. Pioneering psychiatrist Carl Gustav Jung (1875-1961) studied about a thousand horoscopes and made the conclusion that causality does not have to be A causes B. A and B can happen at the same time. He called this phenomenon synchronicity. In astrology, this means that the characteristics of the heavenly bodies have a synchronous effect on the birth of a person or any other event on Earth. Thus, when a person is born, a map of the heavens (natal chart) would give a fair indication of the characteristics of that person’s life. In Astrology, it is very important to know at least three things: the positions of the Sun, the Moon and the Ascendant at the exact moment of one’s birth. The Ascendant is the zodiac sign on the eastern horizon at the time of birth. The Eastern horizon is where the sun “rises”. Thus, the Ascendant sign is popularly called the Rising Sign. Popular astrology is mostly concerned with the Sun sign. The Sun sign represents one’s core personality. But humans are not one-dimensional beings. We have a complex nature. The Moon sign represents the emotions. This involves the “murkier” side of things which popular astrology does not want to delve into so much. On the other hand, the Ascendant sign is the personality one projects to other people. Thus, if somebody tells you that you do not look like a Leo or a Scorpio, that means that what he/she is seeing is not your Sun sign but your Rising Sign. If you ask other people for advice on your career choice, their advice might be based on your Ascendant, the personality that you project. Thus, they might tell you to go to banking or Real Estate (Taurus) when what you actually want to become is a Secret Agent like James Bond (the quintessential Scorpio). Or your heart may be telling you to become an actress (Moon Leo) but your talent actually lies elsewhere. If you consult a newspaper or magazine, it probably would be based on your Sun Sign alone. Your Sun, Moon and Rising Signs can be compared to your Ego, Id and Superego. Or, if you were a house, your Ascendant would be your gate, courtyard and main door. Your Sun Sign would be your living and dining rooms while your Moon Sign would be your bedrooms. When choosing or changing jobs, it is very important to analyze not just your Sun Sign but also your Moon and Rising Signs. But most importantly, look at your Midheaven. The Medium Coeli (MC) or Midheaven is the “highest point” of the natal chart; It is the point of the noonday sun at one’s date of birth. Technically, it is the point where the ecliptic (apparent path of the Sun across the sky) crosses the meridian (line of longitude) which passes through the birth or event in question. The Midheaven indicates one’s career, life goals and public reputation. This is the key to your success – professionally and emotionally. In esoteric (spiritual) astrology, this represents what you want to do and be acknowledged for in this lifetime. Our Sun, Moon and Rising signs are personal to us. Perhaps we allow a few friends and relatives to take a peek at our emotional or personal selves. But for the world at large, we want to be known by our Midheaven Sign. This is the kind of person we want the world and posterity to know. For example, Queen Elizabeth II would certainly not want the world to look at her as friendly, willing, a reforming sprit, rebellious or eccentric (Aquarius rising). She would rather be known as determined, powerful, disciplined and with a sense of purpose (Scorpio midheaven). Scorpio midheaven needs emotional involvement in one’s career and the British queen’s involvement in her career is the prime reason that the English monarchy is still functioning. In the olden days, the midheaven sign was not given much thought because kings begot kings while farmers begot farmers. But in this age of social mobility where janitors can become tycoons and heiresses can become paupers, the midheaven sign looms vital. For many astrologers, this is the destiny or karmic sign. The Midheaven Sign is what you want to do and are supposed to do in this lifetime. 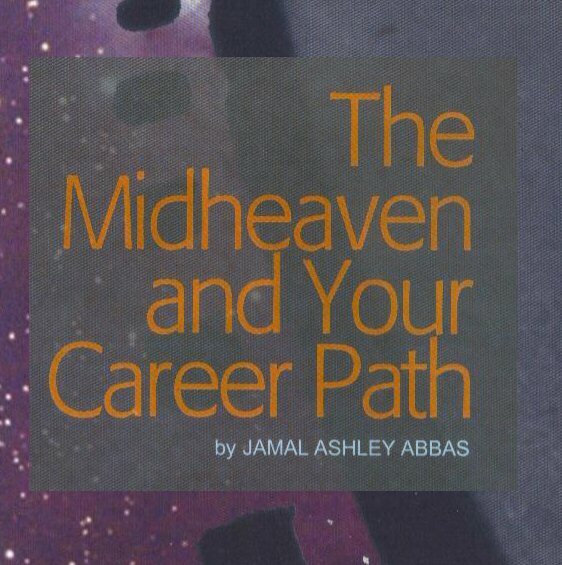 In order to get a feel of what is the best job for you, analyze your Sun, Moon and Rising Signs and then try to see which is most compatible with your Midheaven Sign. ARIES: residential / institutional architect, war correspondent, muckraker, soldier, commodities trader, pro athlete, neurosurgeon, no-desk jobs. PISCES: Dancer, fine artist, medic or chaplain in the military. If you want to be a lawyer, and your midheaven is in Aries, then you can choose which sort of law you would like to specialize in – litigation (Leo), corporate (Capricorn) or civil rights (Aquarius). Pisces Midheaven: Often to be found working tirelessly in the background. Exceptional counseling abilities. Needs variety. Dealing effectively with intangibles. The caring professions, work with the disadvantaged and the minorities, the wine trade, the sea or fishing industries, plumbing, the church, the navy, faith and alternative healing, the occult and anything artistic – fiction, poetry, films. Van Gogh, Christian Barnard, Pope Paul VI, Glenn Miller, Albert Einstein, and Bill Gates. I still don’t know whether career and star signs are related. is it essential for a person under a particular star sign to pursue some profession?